This ninth edition has been thoroughly revised and re-edited by Nicolas Barker, former Editor of The Book Collector, and Simran Thadani, Executive Director of Letterform Archive. With a new Introduction, it incorporates new terms, additions and amendments and, for the first time, illustrations in black & white and color. Nicolas Barker worked with his friend John Carter revising the ABC up to the latter's death in 1975 and has faithfully preserved the spirit of the original. 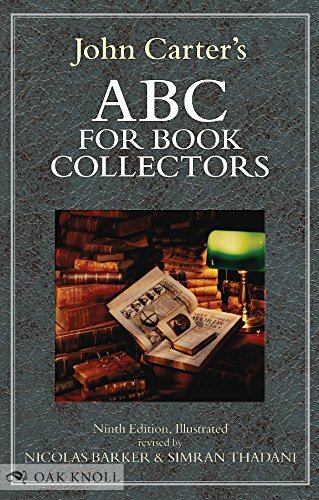 ABC for Book Collectors, while keeping us up-to-date with modern terminology, retains its humorous character and importance as the one indispensable guide to book collecting. View More In Antiques & Collectibles. If you have any questions about this product by Oak Knoll Pr, contact us by completing and submitting the form below. If you are looking for a specif part number, please include it with your message.